Torrington, CT - The students of the Performance Lab at the Warner Theatre Center for Arts Education worked very hard to present three performances of a “contemporary play” by Scott Z. Burns entitled ‘The Library.’ The ten talented teens were directed by Isabel Carrington, who also ran the sound board at the Nancy Marine Studio Theatre on opening night. ‘The Library’ closely echoes the aftermath of the Columbine tragedy in 1999, so you know where this is going. It examines what the director calls “our growing reliance on the ever-present media,” as well as the nature of one’s memory and the “subjective position of ‘truth.’” Ms. Carrington knew that the subject matter of her choice for the winter term would be challenging and brought in a school counselor from Newtown CT to discuss the psychological effects of tragedy and how the paths we take through healing can be varied. Clearly the director and her students were completely committed to the piece. I wanted so much to love this work that the students presented so responsibly, but I had some issues with the play itself. I will admit that the subject matter hit very close to home because I am a teacher in a public school. However, very few of the scenes were actually set in the high school library because the action mostly deals with the aftermath of the shooting. More problematic for me was that some of the plot elements were illogical and a last minute plot twist really wasn’t, at least for me. The fact that teens played all the roles made it a bit challenging to realize who were the adults, and in the case of the bible-thumping mother of a dead girl, that was important to know from the beginning. Many of the characters are thinly drawn, especially the shooter himself who only appears in one scene (and it is not the shooting.) I came away wondering if the main question of which student revealed information to the shooter at gunpoint really even mattered. Be that as it may, I must still congratulate these ten young actors on the work they did before and during their performance on opening night. Beginning with the 15 minutes before the lights went down, each and every one of them could not have been more professional and I am sure that this was a direct result of their fearless director. Despite the fact that I was not seated on the soundboard side of the theater where I can usually see Ms. Carrington’s reactions, I can write with certainty that she was inordinately proud of them all. Meghan Sullivan was a force of nature in the critical role of student Caitlin Gabriel. In her second P-Lab production, this high school sophomore set out to improve as an actress and convey the weighty message of the play to others and she succeeded. HS sophomore Jessica Lay portrayed Caitlin’s mother and senior Charlie Rau (Mr. Mushnik in ‘Little Shop’) played her father, both of whom have some baggage. HS sophomore Allison Rau did well as Dawn Sheriden, that mother of the slain student and a character that is hard to like. Seventeen year old Jacob Honig was convincing as one of the students who survived the horrific shooting. Nicholas Calabrese played a priest trying to help the grieving families and returned briefly as the 21-year-old shooter. Greater Academy of the Arts senior Connor Picard and sophomore Morgan Rinaldi (Patty in ‘Charlie Brown Christmas’) played police detectives investigating the incident and sophomore Katie Locascio was a publisher who thinks the book written by Mrs. Sheriden could become a film. Sophomore Jake Asheim took the role of a gentleman overseeing the distribution of funds to the families, because compensation also comes into play. The nondescript set designed by Les Ober places us somewhere in the US in the near future, with standard issue school chairs and beautifully lit scattered books on the ground in front of the stage. Good projections helped to set the scenes.Mr. Ober was also in charge of the lighting design, while Chris LaPlante designed the sound. Ms. Carrington designed the most-appropriate costumes and helped with the props. 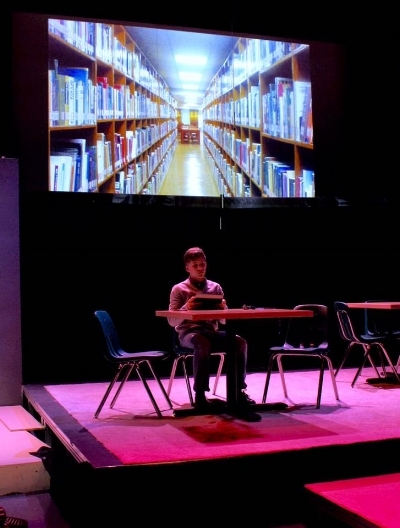 ‘The Library’ is presented without intermission and runs about 90 minutes. Remaining performances are Feb. 4 and 5.